Noahpinion: Review: Ben Bernanke's "The Courage to Act"
Review: Ben Bernanke's "The Courage to Act"
Basically, Bernanke wants the world to understand why he did what he did, and in order to understand we have to know everything. And the book succeeds. Those who are willing to wade through 600 pages of history, and who know something about the economic theories and the political actors involved, will come away from this book thinking that Ben Bernanke is a good guy who did a good job in a tight spot. But along the way, the book reveals a lot more than that. The most interesting lessons of The Courage to Act are not about Bernanke himself, but about the system in which he operated. The key revelation is that the way that the U.S. deals with macroeconomic challenges, and with monetary policy, is fundamentally flawed. In both academia and in politics, old ideas and prejudices are firmly entrenched, and not even the disasters of crisis and depression were enough to dislodge them. 1. 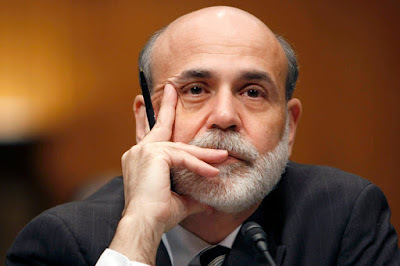 Bernanke was the right person in the right place at the right time. He was almost providentially well-suited to the task of steering America through both the financial crisis and the Great Recession that followed. A lot of that had to do with his unwillingness to downplay the significance of the Great Depression (as Robert Lucas and others did), and with his unwillingness to ignore the financial sector (as other New Keynesians did). 2. However, the institutional, cultural, and intellectual barriers against easy monetary policy that were created in the 1980s, as a reaction the inflation of the 70s, held firm, preventing Bernanke and the Fed from taking more dramatic steps to boost employment, and preventing a thorough rethink of conventional macroeconomic wisdom. 3. Fiscal Keynesianism, however, has also survived, despite generations of efforts by monetarists, New Classicals, Austrians, and others to kill it off. Deep down, Americans still believe that stimulus works. 4. The political radicalism of the Republican party was a big impediment to Bernanke's efforts to revive the economy. Anti-Fed populism, from both the right (Ron Paul) and the left (Bernie Sanders) also interfered with the goal of putting Americans back to work. I didn't have time to read the book. This review was the next best thing. Could you elaborate on that? Do you think about radical measures like helicopter money etc. ? I was thinking of a higher inflation target!